Reverse osmosis is a pressure driven process, with the pressure applied used for separation, allowing the water to pass through the membrane while the salts remain. Electro dialysis is a voltage driven process, and uses the electrical potential to selectively move the salts through the membrane, leaving the product water behind. As the energy input is required in the form of electricity, these are not particularly suitable for using solar thermal systems. The evaporative processes are based on change in physical state of the water and thus are similar to the natural water cycle in which the water is heated, producing water vapor, which is in turn condensed to form fresh water. Evaporative processes have major energy input in the form of heat, and thus are suitable for the use of solar thermal systems. 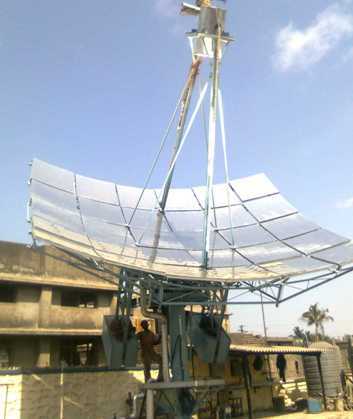 The equipments like solar still are particularly useful for the domestic use. For large scale operation, two main technologies are available. Multistage flash distillation is the process used for the large commercial installations over thirty years. The evaporation is based on the principle of flashing pressurized hot water to form steam. Though it easily handles large flow rates and produces high quality output water consistently, the technology is very expensive and also energy intensive. Multiple-effect distillation (MED) is the most efficient, economical and easy-to-operate thermal desalination process. It is a low temperature thermal process for obtaining fresh water by recovering the vapor generated by the solar boiler in a sequence of vessels (called effects) /each vessel is maintained at a lower temperature than the previous,because the boiling point of water decreases as pressure decreases, the vapor boiled off in the first vessel can be used to heat the next one and so on and so forth, thus only the first vessel (at the highest pressure) requires an external source of heat. The heat is required in the form of low pressure steam or hot water. 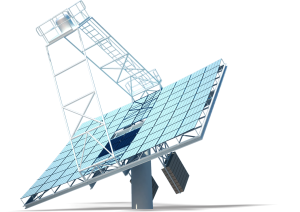 This requirement can be easily fulfilled by the solar thermal concentrators. The typical MED system integrated with solar thermal concentrator ARUN® is shown in the following figure. ARUN®, solar boiler, supplies heat in the form of steam or pressurized hot water at about 150-180°C. This heat is stored in the heat storage tank for the operation during non-solar hours. A desalination plant typically requires heat at 80 – 120°C, which is supplied through heat storage as per the demand. The heat storage at higher temperatures reduces the storage size significantly which help reduce the cost of storage as well as thermal losses. ARUN® dishes have been installed in various thermal applications across industries including laundry in hotels, milk pasteurization in dairies, comfort cooling in offices, effluent treatment in chemical industries amongst other, by reputed companies like Mahindra, TVS Group, Chitale Dairy, NTPC, etc.